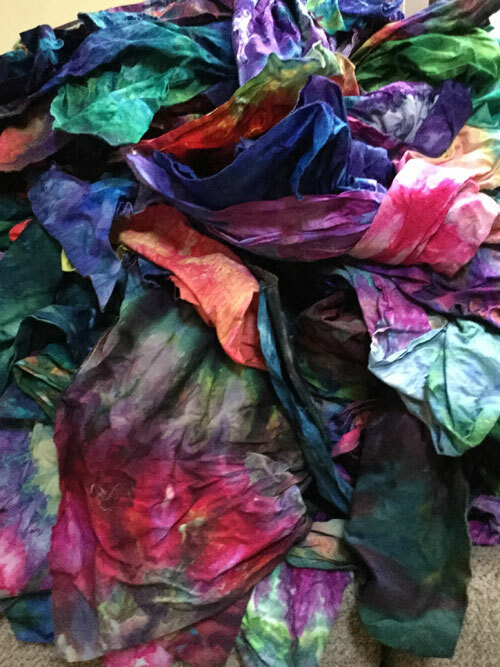 Been using all of that wonderful snow to dye fabric. I have just over 200 pieces dyed, now the ironing begins. It takes a while. I watch DVD’s while ironing, stocked up at the library before all of the new snow arrived. Hope to have new pieces on my website soon. This entry was posted in Creation in Progress, Just For Fun and tagged Hand Dyed Fabric, Hand Dying Fabric, Hand Made Fabric, Snow dyed, Snow Dyed Fabric by Suzi. Bookmark the permalink.